The topic for the Pierre du Bois Lecture, “The Revolutions of 1989 and Their Legacies”, is directly linked to Prof. Vladimir Tismaneanu’s enduring passions as a scholar and as a public intellectual. For him, 1989 represents a watershed in European and global history, because of the demise of the Soviet Bloc, the premise for the end of the USSR, the end of the Cold War, and the search for a new type of politics, rooted in civic individualism and a renewed sense of human liberty. The legacies of this “upheaval in the East” fall in two categories: those which are related to the rebirth of citizenship obliterated under both communism and fascism; and, the reaffirmation of the truth against social Utopia. This is the heritage of the critical intelligentsia, the counterpart to the Leninist debris that has plagued the region in the past twenty years. Prof. Tismaneanu emphasizes the role of the critical intellectuals because the year 1989 can hardly be imagined without them. In the absence of this ethos, the revolutions themselves would not have been non-violent, self-limited, and anti-teleological. The year 1989 and its aftermath, the process of transition from dictatorship to democracy, have marked significantly his personal intellectual itinerary. This struggle for freedom has been his fight, too. In 1982, he settled in the US; starting with the second half of the decade he collaborated consistently with Radio Free Europe, Voice of America, Deutsche Welle and BBC. 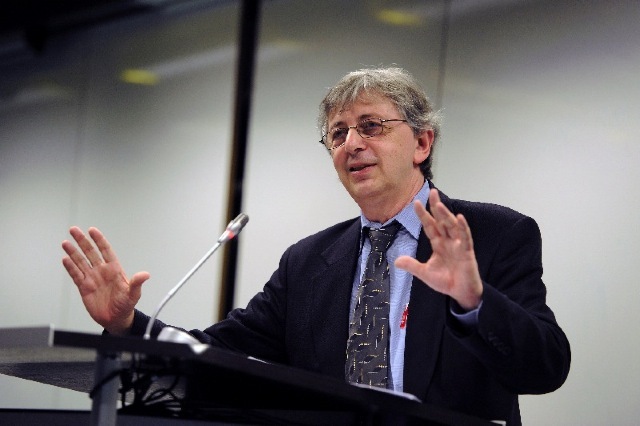 Prof. Tismaneanu published influential articles on Romanian and East European communism in journals such as ORBIS, Dissent, Problems of Communism, etc. His book, The Crisis of Marxist Ideology in Eastern Europe: the Poverty of Utopia (Routledge, 1988), was enthusiastically endorsed by Agnes Heller and Ferenc Feher. Among the many volumes he published after 1989, are: Reinventing Politics: Eastern Europe from Stalin to Havel (Free Press, 1992); Fantasies of Salvation: Nationalism, Democracy, and Myth in Post-communist Europe (Princeton UP, 1998, paperback 2009); Stalinism for All Seasons: a Political History of Romanian Communism (University of California Press, 2003). The last one, in 2004, was granted the “Barbara Jelavich Award” by the American Association for the Advancement of Slavic Studies. His edited volume Stalinism Revisited will come out in November 2009 at CEU Press. He recently completed the manuscript of a book titled The Devil in History. Lessons of the 20th Century. A significant element in his biography is the chairmanship, since 2006, of the Presidential Commission for the Analysis of the Communist Dictatorship in Romania. This commitment expresses his understanding of political science as a scholarly and moral endeavor. He considers that the duty of remembering the communist regimes’ crimes and ensuring moral justice are vital tasks that a democratic intellectual and a scholar should pursue. He regards opposition to any form of tyranny a never-ending objective. His ongoing project is a book on Democracy, Memory, and Moral Justice: Romania Confronts Its Communist Past.